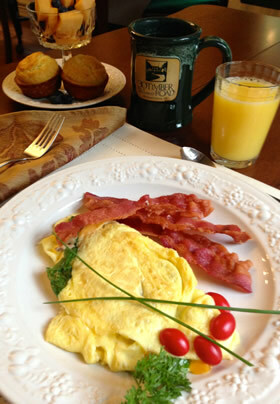 At our bed and breakfast in South Central PA, we pride ourselves on our customer service – which extends to honoring special requests for breakfast and a wide range of breakfast service time. We have a coffee machine available for an anytime “pick me up,” and homemade cookies are usually available in the dining room. We begin each breakfast with fresh, in-season fruit. In early summer, fresh strawberries will be the main breakfast fruit. We will also serve local, in-season fresh sweet cherries, black raspberries, blueberries and blackberries. Our local south central PA orchards provide us with wonderful late-season peaches and apples that we use in our special fruit cups made with organic yogurts. The main dish varies from day to day alternating between an egg specialty and a pancake or waffle entree. The formal gardens at the side of the house are the source for fresh herbs and some vegetables for omelets or egg casseroles. 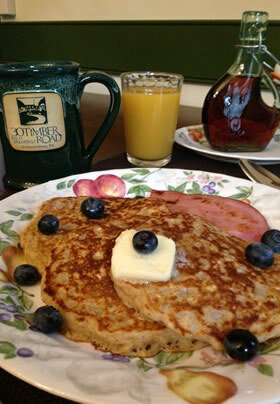 The specialty of the house is Old Fashion Oatmeal Pancakes served with PA maple syrup. We always serve a side of breakfast meat bought locally from the farmers’ market or a local butcher shop. If you request a “PA Dutch” specialty such as scrapple or pudding, we will make some of my mom’s and grandma’s recipes for you! To go with your egg dish, we serve you with fresh homemade muffins, bread, or scones. Join us at about 5:30 PM on your check-in day for a Welcome snack – cheese and a glass of Pennsylvania wine or perhaps fruit and a sweet treat. It’s a great time to meet the other guests or get information about the area for planning your next day’s adventures.